Good morning, Friends! Well it seems like the weekend has flown by! I'm so glad that I will get to spend the majority of my day today stitching with friends! Becky and I will have breakfast and then it's off to Black Sheep! So relaxing! Hopefully I will even start to feel this head cold go away!! Ugh! It has been fun watching the Olympics, too! And the weather report is reporting rain and warmer temperatures for us this week! I think that's the best news of all! Rain will definitely feel like spring is on it's way! Super simple!! Thanks for stopping by and have a super day! 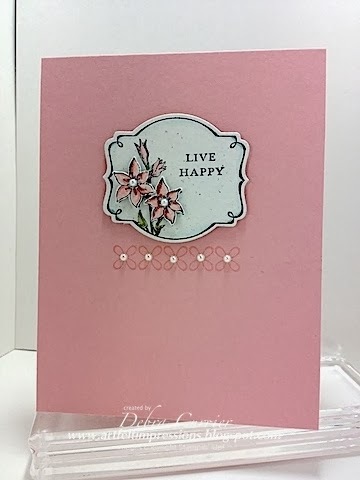 Love this simple card, so effective and looks great in Blushing Bride, which is not a colour I use often. The paper piecing really makes the flowers stand out too - worth the fussy cutting! Oh, so sweet & lovely! Wonderful take on the sketch!